Place a bench in front of a cable machine, with the pulley positioned just above the height of the bench. Sit on the bench so that you’re facing the cable machine and grasp the bar using a supinated (underhand), shoulder-width grip. Lie supine (on your back) on the bench and slide up the bench until the cable is pulled taut. Your elbows should be by your sides and your arms should be fully extended. Keeping your body flat on the bench, exhale as you curl the bar towards your shoulders until your elbows are fully flexed. Once your elbows are fully flexed, allow them to move up a little (shoulder flexion), just until your forearms are horizontal with the floor. Inhale as you lower the bar to the starting position, with your elbows by your sides and your arms fully extended. If a straight bar is hard on your wrists, use a wavy bar or a v-bar. The point of lying on your back for the lying cable curl is to eliminate all body momentum and therefore prevent cheating and better isolate your elbow flexors. If you don’t have a bench, you can lie on the floor. 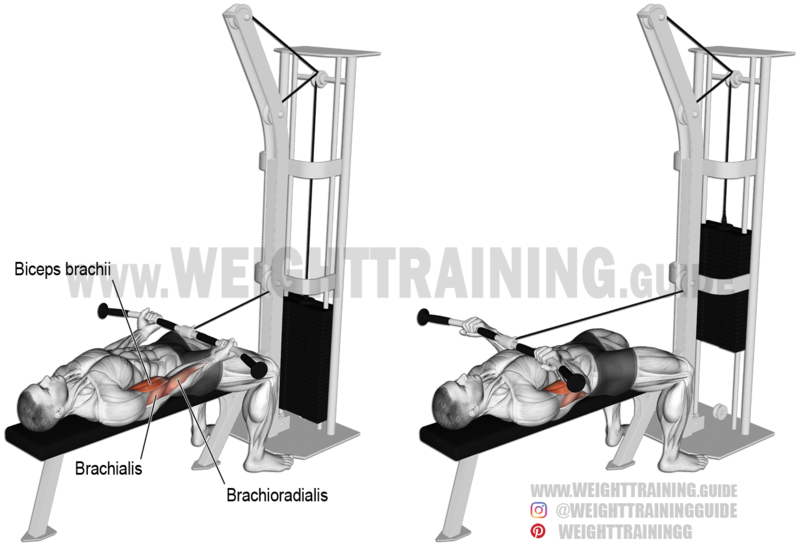 You can also perform the lying cable curl on a standard cable row machine. The lying cable curl is also known as the supine cable curl. See also the cable curl. Here’s a demonstration of the lying cable curl as performed on the floor instead of on a bench.